Last weekend I had friends over for dinner and decided to make sorbet for dessert, finally using an ice cream maker gifted to me last fall by a friend who was moving away. I read through dozens of recipes—so many possibilities!—for strawberry, lemon, lime, basil, pepper, and a plethora of other sorbets. I was hoping that Stanley's would still have Meyer lemons in stock since they seemed to be popular for making sorbet, but no such luck. I finally settled on lemon-basil-ginger sorbet, and the day before my guests came over I put the bowl of the ice cream maker in the freezer (it's supposed to stay in there for 24 hours) and made the sorbet base so that it would have time to chill. The next morning I placed the frozen bowl in the ice cream maker, poured in the chilled sorbet liquid, and let the machine do its thing for about half an hour. Nothing happened. The liquid stayed liquid. I left the liquid in the bowl and returned the whole thing to the freezer, hoping that it would freeze up enough to turn into sorbet. Eight hours later I pulled it out—still liquid—and tried putting it in the machine again. Still nothing. It occurred to me, though, that the sorbet base was essentially just a flavored simple syrup: sugar, water, and lemon juice infused with lemon zest, basil, and ginger (the solid ingredients were left in the liquid overnight and then strained out). Dessert would be cocktails instead of sorbet. 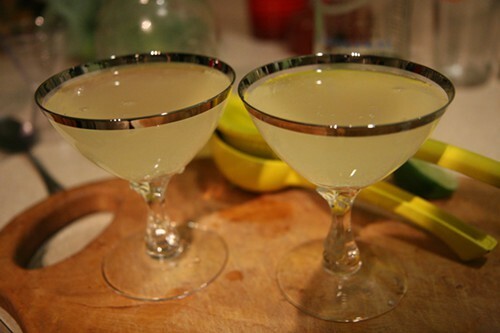 After considering several options and polling my guests, I decided on gin for the cocktails, which I mixed one to one with the sorbet liquid. It was a little too sweet so I added some lime juice (OK, if we're being totally honest, I used TrueLime—I usually squeeze fresh juice, but I didn't have the time or energy just then). Then I poured the mixture into a plastic bottle and carbonated it for good measure. If I couldn't manage the wow factor of homemade sorbet, carbonated cocktails would have to do. I didn't get any complaints (though my friends aren't likely to complain about being served cocktails for dessert). Since I had lots of syrup left over, later in the week I tried mixing it with a couple other liquors. I started with pisco, which yielded a drink very similar to a pisco sour—the basil and ginger flavors were subtle to start with, even more so once the alcohol was added. It was a nice light cocktail, though, perfect for the balmy 50-degree weather we've been having. 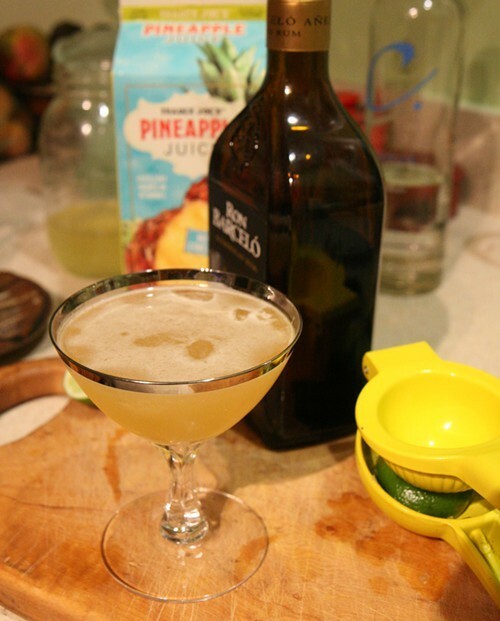 Next I tested the syrup out with aged rum; it didn't taste quite right, but adding a little pineapple juice—and a bit more lime juice (real this time) to balance out the sweetness—improved it considerably, making a tropical-tasting drink. I wouldn't advise scrapping your favorite cocktail recipes and using a sorbet base instead, but for using up the liquid from failed sorbet the drinks worked great. And why did the sorbet fail to freeze? There are two possibilities: my freezer doesn't get cold enough (it does freeze ice, but slowly; it's not super efficient) or there was too much sugar in the sorbet base (sugar lowers the freezing point of water). I used an Emeril Lagasse recipe from the Food Network that called for a couple cups each of sugar and water and three tablespoons of lemon juice—some recipes called for up to two cups of lemon juice. 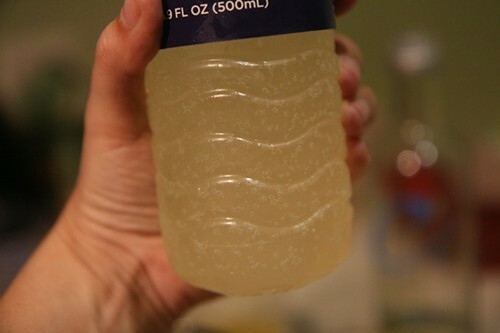 I did up the lemon juice in the recipe a little, but next time I'll try increasing it even more. First, though, I'm going to get a freezer thermometer.